John R. Ammon is a practicing anesthesiologist in metropolitan Phoenix, Arizona. He has been in practice for 37 years since training at the Massachusetts General Hospital/Harvard Medical School program and fellowship training in cardiovascular anesthesiology at the Stanford University Medical Center. He has served on medical school faculties at the University of Pittsburgh and the University of Arizona throughout his career in private practice. Dr. Ammon served as a director of the American Board of Anesthesiology, the certifying board for anesthesiologists, from 1987 to 1999, and as its president from 1998 to 1999. He currently serves on the Advisory Board of the Center for Political Thought and Leadership at Arizona State University and is an Instructor in the ASU Extension Center. 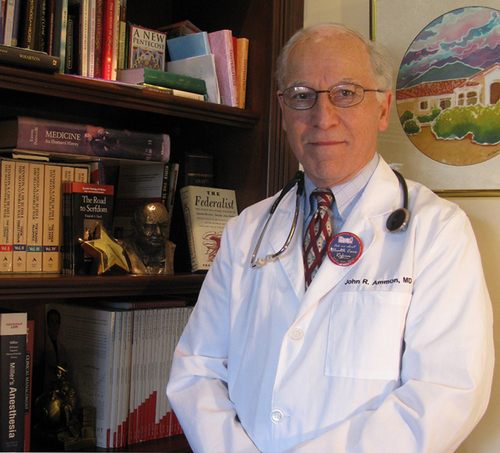 He is the founder and first president of the Arizona chapter of Docs4PatientCare, an organization dedicated to protecting the sanctity of the doctor-patient relationship and advocating for genuine reform of health care insurance and financing and limiting the government’s role in health care decision making.